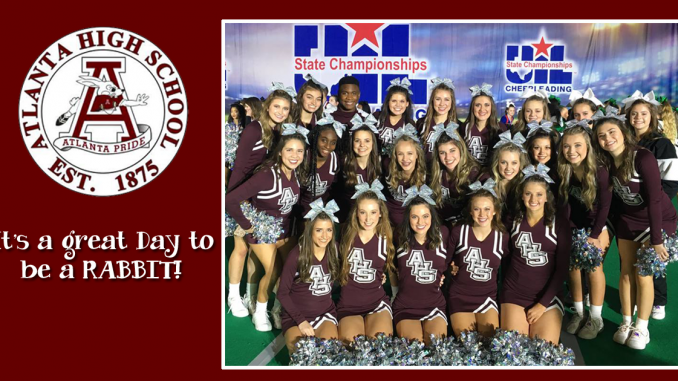 Atlanta, Texas – For the 4th consecutive year, the Atlanta High School Cheerleaders are UIL Spirit State Finalist. On Thursday, January 17th at the Fort Worth Convention Center, 76 Texas 3A Cheer Squads competed in the preliminary round and only 20 squads advanced to finals. The Atlanta High School Cheerleaders placed 9th overall in the UIL Spirit 3A State Championship. Spirit is an extracurricular activity that focuses on the traditional game day role cheerleaders have on the sidelines and in schools supporting athletic teams. At the UIL Spirit State Championships, schools compete in three categories: crowd leading, fight song, and band dance.